Hello, battle commanders. We’re back here again with a brand new update regarding what you can expect in the Alpha Program. This February will see lots of activity involving Battle for Sularia and the Alpha Program as well as our website. John is working very hard to roll out our new web platform and we had hoped to have this site rolled out by now, but like all good things, it takes time and we have to wait just a bit longer. The Alpha Program doesn't wait for our new website, so we are going to continue to push content forward and out to you over the coming weeks. New Alpha Program page on our website for all things related to the Alpha Program. On February 6th, 2018 we will release Command Pack Series 1: Pack 1. Which is a really fancy name for 4 brand new cards inserted into the Alpha Program. As a reminder, these cards are completely legal and ready to be played in Alpha format events. So get to downloading these print and play files as soon as possible because you do not want to miss out on some of these cards. Harrier's Perch is a brand new idea for a mechanic inside of Battle for Sularia and one that is unique compared to other strategy card games. We are beginning to play with an idea of reducing card construction cost by paying for other cards. Harriers Perch is the culmination of that idea, where players can invest in it and get a powerful ability that allows you to search for a Gray Harrier. Additionally, it drops the construction cost of cards with Harrier in their name to one! We cannot wait to see what all of you Battle Commanders come up with and as you can be assured we are preparing to play more on this card in the future, with more Harrier fliers in the Jotune design. Continuing in the spirit of the design of Harrier's Perch, the Synthien get a powerful new ability card and one that helps keep those Harriers from getting too far out of line. Sularium Storm is a powerful new direct damage ability that gives the Synthien a great answer to many of the powerful meta decks. In addition, Sularium Storm reduces the construction cost of Sheild Generator Installation to one. This enables the Synthien player to build with more powerful effects by reducing the number of sites that cost more than one. Freeing up valuable construction points gives Synthien players many new options. Mayhem is a powerful condition for the Exsularian. The Exsularian have two, already good, conditions in the form of Distraction and Secret Stash, but Mayhem gives them one of their first proactive condition cards and boy is it a doozy. Players against Exsularian better be ready for the onslaught of site punishing removal cards and adjust their strategies to compensate for the early site losses. Primordial Cera continues on the design thread of powerful mythical creatures in the Protoan design. We established this thread in Reign of Terror with Syrana, Parasitex, Dragos, and SKOBN. The main difference being is that Primordial Cera offers a powerful Type 1 that only costs one construction point to place into the deck. The Cera continues to grow more and more powerful with each new deployment, which is also a great new mechanic that plays off of the draws where player's get more than one copy of it. This continues the thread of player's having uses for Protoan type 1’s when an additional copy is drawn. I am excited to announce our first every Alpha Program TTS Tournament. It will be held on Saturday, February 17th, 2018 starting at 12:00 pm CDT. The Registration for the tournament will be uploaded within the next few days to our web store and will be a free entry. 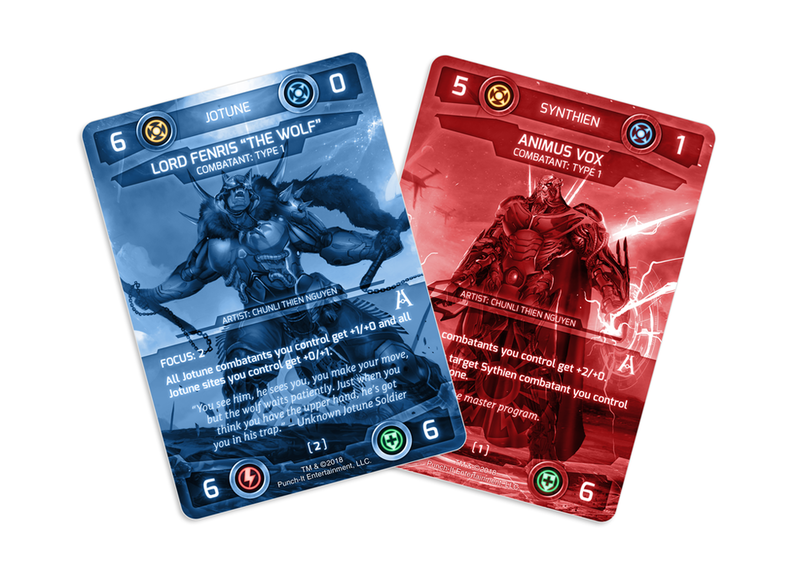 The prize pool for this tournament will be one playset of either the Alpha promo Animus Vox or Lord Fenris. Depending on the entry count the tournament will be either a round robin or a swiss round system with qualifiers. This decision will be made prior to the tournament and be communicated with entrants at least 24 hours before the tournament start time. You will need an updated copy of the Battle for Sularia mod found on Tabletop Simulator. You can download the mod today, and before the tournament, the Reign of Terror and CPS1 Pack 1 cards will have been added and updated appropriately. We are aiming to have this update completed by early next week. Our website is receiving a new link and subsection under Products -> Battle for Sularia. This new subsection is called Alpha Program and is the definitive resource for all Alpha Program material. The page is laid out with the latest Alpha Program release featured at the top, next you will find the Alpha Program signup form, followed by this month's current Alpha Program promo cards, and then finally you will be able to provide feedback regarding any of the Alpha Program cards through our feedback submission form. We hope that you will bookmark this page and return to it often as your feedback is crucial to the success of the Alpha Program. Please note, when John has the new site up and running in the next week or so, we will send out an update on this link. The Alpha Program and the future of Sularia design are directly impacted by you the players, and this means open lines of communication are imperative for this program and idea to be successful. While feedback is purely optional, we do appreciate it greatly! As mentioned previously your feedback is so crucial to Battle for Sularia's success. The first line of defense in that is our rules and updates to the rules. We need your help as valuable Alpha Program members. Please read through this document and use our feedback form to report any issues. Nothing is out of bounds on this feedback, if you feel the rules need a better layout, need more information, less information? You are our first line of defense in releasing high-quality products. We hope that your feedback will begin coming in rather soon, in order for us to turn this document over to John and let him do his design wizardry that makes all Punch-It products adhere to the highest quality possible. Not much to say here, if you are an Alpha Program member you will be receiving an email shortly that will have the promo codes necessary to order these cards for $5 + shipping. For those of you overseas, have no fears, we've been able to secure a reasonable way to ship these cards to you each month which for the first time ever will allow our website to ship directly to Canada, and the EU. Please keep in mind these promos will originate from the US so we cannot guarantee there will not be import surcharges, but as our game continues to grow we will continue to expand our fulfillment channels and make additional improvements. Now onto the Cards Themselves! I hope you think these look as good as the team here does! John keeps pushing the limits on what we can do with our original card designs and this is another great example with how versatile those designs have been. We think every Battle for Sularia collector will want to add these to their collections. These cards will not remain in our store forever, in fact, they will be removed from the store February 28th, 2018. So don't delay and get your orders in before then. Because once they are gone, they will not return. Seriously. You can expect brand new promo cards in March—boom! Well, that's it for this update. Thanks for getting this far! And as always, if you have any questions please feel free to comment below and don't forget to like this post and maybe consider sharing it with your local communities as well. Until next time Battle Commanders!